NEW EVIDENCE FOR BIG CATS IN BRITAIN. The latest report from the British Big Cats Society not only reveals startling new evidence for big cats in Britain, but also that the numbers roaming our countryside could be increasing. The report, covering research from April 04 to July 05, is to be published exclusively in the April issue of BBC Wildlife magazine on sale16 March 2006 (�3.25). The BBCS report reveals that 2,123 sightings of big cats were reported between April 2004 and July 2005. The South West once again proved a hot-spot for sightings, with Devon, Cornwall and Somerset all featuring in the top ten big cat locations. Scotland came in third, seeing almost a 50% drop in sightings reported, and was replaced at the top by Devon. Wales was 4th on the list with 123 reported sightings and incidents. Almost 60% of all the sightings reported were of black cats, and 32% were of brown or sandy coloured ones, which the BBCS believes to be pumas. Another 6% were lynx type cats. New evidence published includes a skull found by a Devon farmer in July 2005 that has now been identified as that of a puma; three reported attacks on horses; over 35 incidents regarding sheep kills; several confirmed paw prints of which plaster casts were taken; and 17 reports of a big cat with cubs � an increasing trend, which suggests that the animals may be breeding. During the study over half a dozen hair samples, now awaiting analysis, were also collected. The BBCS has also gathered evidence of at least 23 releases of big cats into the wild since the Dangerous Animals Act was passed in 1976, including a panther, pumas, lynxes and a host of exotics including caracals, ocelots and jungle cats. Many of the original owners are now owning up to their past misdeeds. Keen to expose evidence that is not genuine, the BBCS also reveals in BBC Wildlife magazine that it has in the last year uncovered several �hoaxes�, including a photo of a supposed black panther printed by two national tabloids in April 2005. It turns out, the big cat is in fact a full size black cuddly toy panther. The BBCS is hoping for national support from the Government, in particular the police and Defra, and can confirm that some regional police forces are already taking a keen interest. Gloucester Constabulary�s Wildlife and Environmental Crime Officer Mark Robson has been collating sightings since 1999, and has developed a contingency plan setting out what police officers should do when they receive a big cat report. Robson is also working with the BBCS to build a nationwide database of big cat reports to help understand the animals� movements. The BBCS intends to continue its research and obtain hard evidence by using camera traps that are triggered by animal movement � a technique that has been used to film rare Sumatran tigers in the wild, helping them to �Prove and Protect� the big cats roaming Britain, determining species and possibly numbers. PHOTO OF BIG CAT PROVES TO BE A FAKE! Over the years several �hoaxes� have been exposed by the British Big Cats Society; this now includes a photo of a supposed Black Panther printed by 2 national tabloids back in April. The digital photo taken in South Wales was investigated in detail by the BBCS and has now been exposed by them as a picture of a full size black cuddly toy - Panther. 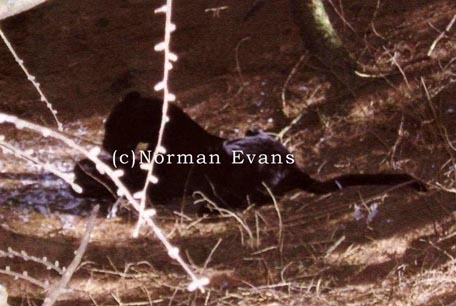 Norman Evans from Cwmbran took this photo on his digital camera - and still to this day maintains it is actually of a Black Leopard. After indepth investigation we believe 100% that it is in fact a Large cuddly toy! After fully evaluating the photograph, considering the circumstances in which it was taken � and visiting the place myself & talking to you in detail; I have made the following conclusions from the evidence surrounding your �Big Cat� image taken in the woods in Cwmbran, South Wales. P1010007 - The 3rd Image is your �Big Cat� Image. As you can see by the numbers there are 4 images therefore missing � I accept that they may have been deleted �as you go� whilst photographing � which is the only way this could have happened. However the fact that you never mentioned you had done this � and the fact there are only those 3 images on the card � does make it somewhat �suspicious�. 2 � The FACT you were able to get so close to the animal is rather �confusing� to say the least. No �Wild large feline� � would ever allow it and even in places such as Africa � it�s highly, highly unlikely. 3 � The FACT you only ever took 1 photograph of your �Big Cat� � does not help strengthen the validity of your image � if anything it weakens it. 4 � The FACT that the �big cat� in your image � has a broken tail in 2 places � which bends at 2 different angles. Cat�s tails are simply not able to do this � if they do they are damaged and the cat would be in a lot of pain. This can be seen clearly in the �closer� image below. A) Towards the front of the �big cat� � you can now see an eye and also a tongue and a clearer outline of its face. The �big cat� looks � completely �dead & lifeless� and the head shape & neck are far too thick for the type of feline this �represents�. B) On the back of the animal the sun is reflecting on it � this does not look like fur � more like �velvet or brushed cotton�. C) Looking at the �paws� of the animal, they do not look real. D) There is no blood anywhere to be seen. E) The general �thickness� of the animal is too big. F) It is not sat right and looks to be lying in a very uncomfortable & awkward position. a) It is certainly the place where the image was taken. b) There were remains of a dead animal possibly pigeon. c) There was no other evidence of ANY cat at the scene � no paw prints � no tree scratching � no smell - in fact not much at all. d) There was evidence of the woods at that location being �used� by humans regularly in some way � walking dogs, camp fires, shelters. After considering all of the above, I firmly believe that the photograph (P1010007) is actually of a large, stuffed �cuddly toy� � full size � Black Panther. These are easily available from various sources. I do however firmly believe that in your immediate & surrounding areas � there are big cats � most of which that are sighted are either Large Black Panther �type� Cats (possibly melanistic Leopards) � or Brown / Sandy coloured cats, (which we believe to be Pumas). On occasion not too far away we have also had a few definite sightings reported of Lynx. So there are big cats around and they do move around the �welsh boarders� often, it�s a very active area for big cats. Unfortunately your photograph is not one of them. A new forum for the society has been created at www.bigcatforum.siteburg.com. While it is still in the earliest stages of life it is free to view and post to by anyone, but you need to register separately. We hope the forum will serve as a place for interesting and informative discussions between our members, but it is being moderated and we will take actions to ban anyone who posts offensive, obscene or innapropriate material. 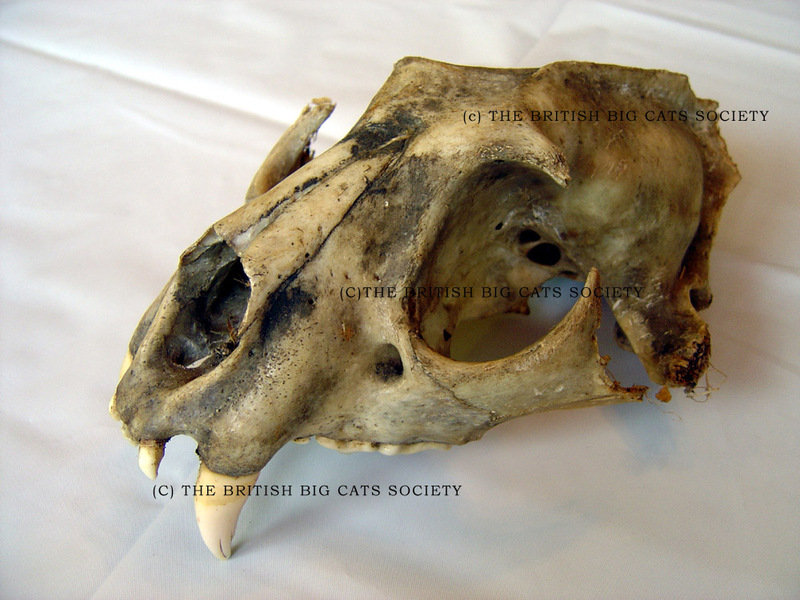 The British Big Cats Society has recently revamped and improved its website. As well as the svelte new aesthetics, the database capabilities of the website have been upgraded, giving us better control over the large amounts of sightings data that has been collected. The members area is also being improved, but for the first few days you may be unable to access this section. Please bear with us, as we hope to have everything back to normal as soon as possible. Should any problems persist, please email us. The British Big Cats Society set up 5 years ago to monitor and study exotic felines in Britain � called for �calm� today; after a big cat encounter in south London left a man with minor injuries. Anthony Holder, had ventured to the bottom of his garden during the early hours of yesterday morning, after hearing his own pet howling. Today the British Big Cats Society has launched a new website which may help prove the existence of Big Cats in Britain � www.bigcats.tv will work alongside the existing website � www.britishbigcats.org � which has now had over 100,000 hits in just 3 years. The aim of the NEW big cat website is to link up to some brand new digital �Trigger� Video cameras out in the wild � so that web surfers can see instantly see some of the latest pictures taken from remote places. Already the BBCS has several �normal� trigger still cameras; however these are only activated when something moves past them and breaks an infra red beam. The new camera systems will be able to take digital images and within a few seconds be able to upload them to the website. The BBCS is planning to start the new project in the New Year and will spend the next 3 months researching into the best places to put them. This week the British Big Cats Society released data from its 15 month survey, which lasted from January 03 till March 04. The results published on its website www.britishbigcats.org indicate that there is little doubt that big cats are roaming Britain. The BBCS are now calling on the DEFRA & the HOME OFFICE to work towards undertaking a long term and UK wide properly funded scientific study. Overall there were 2052 sightings reported to the BBCS throughout Britain (that�s over 4 per day!) � The top 10 in the �league table of big cat sightings are; Scotland (231) Kent (141) Yorkshire (127) Wales (102) Devon (100) Cornwall (96) Lancashire (86) Ireland (82) Lincolnshire (80) Somerset (69). This year the BBCS was able to break down the data in several areas � and this produced some interesting facts and figures. For instance regionally the percentages of sightings were as follows; south West 21%, South East 16%, East Anglia 12%, Scotland 11%, and West Midlands 9%. The British Big Cats Society is appealing for more evidence of the presence of big cats in Britain. For the last 3 years the society has compiled a complete run down of sightings in each county � alongside its findings from video footage, paw prints and hair samples. During 2002 the BBCS collected over 1,000 sightings across Britain (1,087). Approximately 1 month from now they will release their data from 2003 after they have given a presentation to DEFRA officials. �We are delighted with recent events � the NFU have pledged their full support to us and Defra have now invited us to give a presentation to them. Hopefully working alongside the right organisations and also the authorities we can start to push for a properly funded and long term study on the Big Cats in Britain." Indeed the BBCS strongly believe that big cats are seen on a much more regular basis than previously thought, mainly because people fear not being taken seriously. They estimate that for every sighting approximately another 3-4 go unreported. The British Big Cats Society an organisation formed 3 years ago to collectively study sightings and evidence of Big Cats roaming Britain was today excited by the news that the NFU have decided to join forces in collecting evidence of big cats from its members. The NFU yesterday urged farmers to contact the British Big Cats Society which is already involved in conducting nationwide research into the presence of these unidentified big cats currently roaming the British Countryside. The British Big Cat Society today released details of Big Cat sightings reported during 2002 � including new evidence of their existence. The staggering figure of 1,077 sightings that occurred last year was collected by the society and its members. A further 679 sightings were reported from previous years; again Scotland was the hotspot in the UK, with Devon (97), Kent (92)and Wales (86) the other major areas. The BBCS also had reports in every county and some of evidence included: 4 New bits of video footage, 3 confirmed attacks on horses, 2 confirmed Cat �Encounters� with humans and a previously unreported �Dog kill� � (not far from the recent one in Wales,) Recently the BBCS contributed to a 10 page article for the Fortean Times magazine � (FEB 2003 FT 167) in it is a list of cats � entitled �Bodies of Evidence��it lists 1 PUMA, 2 LYNX, 3 JUNGLE CATS, 5 LEOPARD CATS and 1 CARACAL, all of which have been found in the UK since 1980.